I did not post the passing of my sweetheart here on my blog, but I did so on Facebook. It has since been a very, very busy week and I didn’t have time to post anything, anywhere. But her funeral was yesterday, and now things have calmed. In the evening it was time to sleep, but I could not do so immediately. In the deep of night after my sweetie’s funeral, I needed to express my feelings, and Twitter was the medium. Since not so many follow my Twitter feed, here’s that series of tweets. Today my beloved wife Waltraut and I celebrated our 35th wedding anniversary! 35 is a good number, and while not as amazing as 50 or 60, it is still respectable. We’ve had our frustrations, our disagreements, and our grumpy days together, but through it all love has shone through. 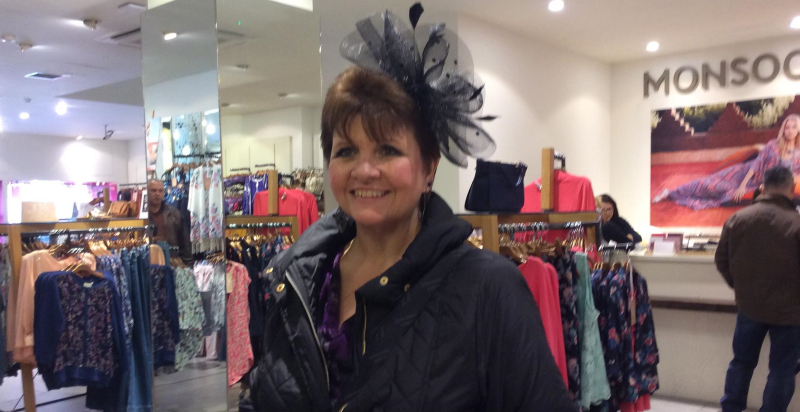 She has made my life worth living, and without her I doubt I would have achieved as much as I have, nor will it have been anywhere near as happy. It’s bittersweet, though, because she will not be with me much longer. Cancer, or “The Big C” as John Wayne called it, has shortened her days, and our path as one will soon part into two as she goes to that far country from which none return. I’m trying to be poetic here, but there is no poem in my heart. Faith comforts me that we will be together again, and in a far better condition than now, but that is the future. At this time it is still the present cold reality that confronts me, and in just a few weeks the inevitable will happen. I will take full advantage of the time remaining to us, of course. But it will be a sad “au revoir”, or, in her native tongue, “auf Wiedersehen”. As those words suggest, this will only be a temporary separation, and I rejoice for that reason! And as I rejoice at having had a fine 35 years of glad partnership! Just a few days after my last post here my wife and I discovered that her cancer had advanced past the point where the medical types thought they had a chance of a successful treatment outcome. One of the physicians told us that she thought that at this stage any attempt to arrest the cancer would likely result in a faster and more painful demise than if it were just left to take its course. And my wife agreed that she wasn’t going to fight it any further. I haven’t posted anything in the meantime, but as the matter has progressed I thought I should take a moment to report. With the help of Providence Hospice Services my sweetheart has been able to deal with the inevitable health decline and the increasing pain. There is still much to expect along that line, unfortunately. She had a rather rough night last night and I stayed home for part of the morning in order to consult with the hospice nurse who visited us then. The nurse advised her to increase the dosage of painkiller, as it does her little good to put up with it, there being no glory in enduring pain if you can avoid at least some of it. As for myself, it is getting harder to concentrate on work. For the past three months I could bury myself in coding or problem solving and get some temporary respite from what is happening to my wife. But this is gradually getting harder to do. I shall soldier on, however. How can it be otherwise? It is she who must be brave in the face of the enemy, and deal with what is happening to her – how can I, who am in no pain, be weak and a crybaby when she does not herself yield to the weakness, despite knowing what the outcome will be? If I were back in the Army and were ordered to storm an enemy bunker with only a rifle and a grenade, I know very well that I would have a better chance of survival than she does right now. And who deserves a medal if she does not? But all is not lost. Because of the love of Christ for mankind there is no string in death, nor will the grave be victorious in the end. And while we must temporarily surrender to the consequences of the fall of Adam, in the end the Lord’s triumph at Gethsemane and Golgotha will prevail! This isn’t an April Fool’s in and of itself, but I went to Google.com in order to see what they had come up with for an April Fool’s Doodle this year. 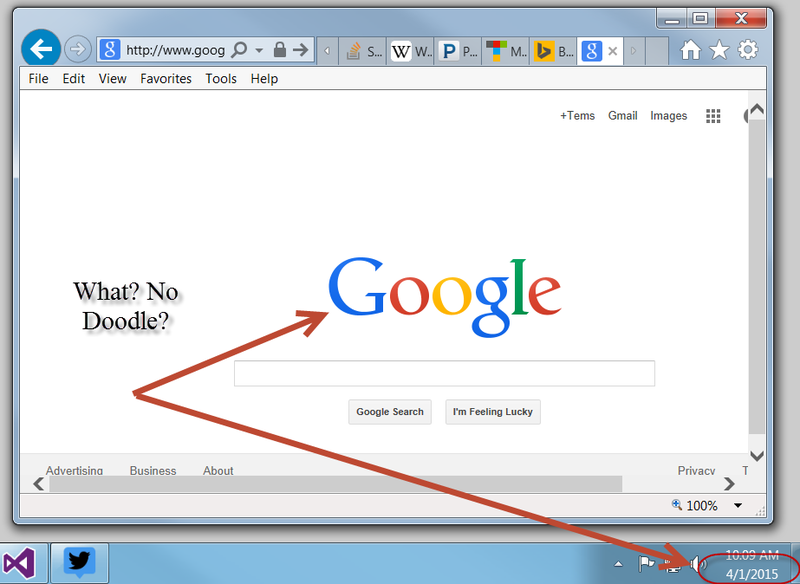 But apparently they have decided that it’s Opposite Day and no special doodle is displayed, just the regular Google. That’s my screenshot, just proving that I did see this. I am actually amazed at this. My earlier post on global climate change, “We’re All Going to — Die? Warm Up?“, got some interest lately when someone in a forum I participate in challenged me on it in a private message exchange. Since it was a private message exchange I shall not identify my correspondent by screen-name, but I will call him ClimateChanger. As background I will say that ClimateChanger is all on-board with Anthropogenic Global Warming. The apparent intent of his challenge was to convince me that (1) global warming is happening, and (2) it’s all our fault. I also got a sense from him that (3) this is bad. Do you ever find yourself trying to convince someone that you agree with them on some issue, but they continue to try to persuade you over to their side of an issue? Does this annoy you, too? I know, right? The The Holocene Climate Optimum was generally warmer than today, but only in summer and only in the northern hemisphere. More over, scientists know the cause of this natural warming, and know without doubt that this proven “astronomical” climate forcing mechanism cannot be responsible for the warming over the last 100 years. This was in reference to the Holocene Temperature Variations chart I posted. 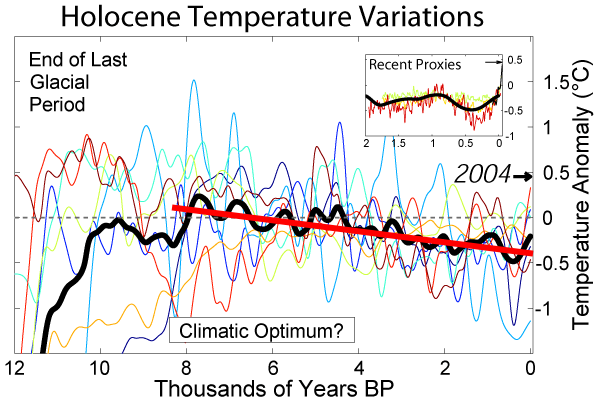 As to the matter of “regional temperature”, the graph actually consists of several temperature tracks as found in many locations throughout the world, and provides an average of them all (the dark black line). Note that he is right that some regions were colder and some were warmer than the average. But that is characteristic of “average”, and not an argument against the graph. Seeking an average in this case is not to say that everywhere on the globe marched in lockstep to the graph. The average temperature merely identifies the trend. And he is also correct that during the HCO the northern hemisphere experienced warmer temperatures — he left out the fact that the southern hemisphere had lower temperatures. Oh, well. Even if true, even if we are still not out of the last ice age, that does not explain the rapid rise of the global temperature since 1980. The global temperature increased more than 0.5 degrees in just 30 years. Why did it accelerate in a few years? Your own graph shows the Earth was getting colder, but now the Earth is hotter than it has ever been in the last 12,000 years, see your own graph. …as we move off the chart to the right, the temperature line goes up to near 0.5 degrees. I said this twice, in fact, but he either ignored or missed it entirely — all the while telling me to look at my own graph! Yes, my own graph shows an sudden increase to 0.5 degrees, and I mention it twice in one paragraph. Who is he arguing with? I can’t be with me because I wrote what he appears to be trying to claim I didn’t write several months ago. I love it when someone tries to argue with me as if I were a climate change denier, and on top of that, doesn’t have his facts straight about even this basic concept in climatology: we’re in an Ice Age, dude. It’s only looks mild because we’re in a temporary interglacial period. I also love it when I write about how greenhouse gases are apparently providing some forcing of the global temperature, only to have someone turn around to try to convince me that science has shown that CO2 is causing temperatures to rise, as if I said something to the contrary. Now, I will admit that I don’t believe that humans are 100% responsible for all this. So far, anyway. I’m persuadable — in fact I used to believe that there was no anthropogenic global warming, but I’ve come around on that. There is more to the conversation, but I am not going to extend this post to go on and on about it. I think I have demonstrated my point, which is that people should actually read what they are supposedly responding to before they attempt to respond to it. Several years ago the City of Olympia planted some trees along our street, and these were immediately attacked by the low-life vandals who walk through the neighborhood from time to time, heading from the downtown bars to the Section 8 housing located up the street from us. The new trees were barely a week in the ground when these idiots (don’t know who they were, but I know their kind, at least) deliberately broke many if not most of them in half. City crews came out and tried to fix them, but the vandals had done their work too well, and the tops of these trees eventually died. Sickening. But, the trees themselves did not die, and they continue to grow. It hadn’t occurred to me to wonder what kind of trees these were until a couple of days ago when I happened to notice that there were two varieties. The ones growing on the north side of the street have sort-of spiky light green leaves and produce copious quantities of red-orangish berries. The ones growing on the south side have more rounded but dark green leaves and produce copious quantities of dark red berries. This piqued my curiosity. Neither produce tasty berries — they aren’t too bitter, but they are astringent, and the birds don’t seem interesting in eating them. So what are they? A query via email produced an interesting reply. 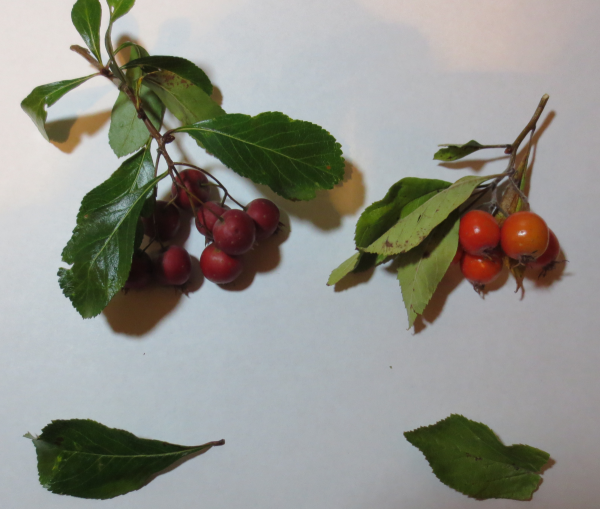 The responder wasn’t sure of the exact species, without a photo at least, but suggested they were either Serviceberries or Mountain Ash. A quick look at Wikipedia showed that these were no way Mountain Ash (or Rowan) — the leaves are completely different, and so are the berries. But Wikipedia makes it pretty certain these are some species of Serviceberry, or Amelanchier. But which two species? At least some of these species are edible, but neither of the two types of tree on our street are producing fruit that I would call edible. What species of Serviceberry are these? Any ideas? I’m sending a link to this post to the City Arborist, and if I get a response, I will update accordingly.